The Sierra Club's legal challenge against the Calico Solar power project drew some criticism, with many describing the situation as "Green vs. Green." This is not a surprising reaction since the headlines depict the situation in simple terms: environmentalists opposing the solar energy they have been demanding. Although the Sierra Club's petition in California's Supreme Court represents the first serious challenge from a national environmental organization against a solar energy project, environmentalists have opposed other forms of renewable energy in the past. The difference between renewable energy and "green" energy has become ambiguous as many corporate and political interests begin to don green masks and demand unwavering support from Americans looking for a solution to our world's environmental woes. Distinguishing between green and greed is crucial if environmentalists want to adhere to their basic principles--advocating for a clean environment and the conservation of natural resources. 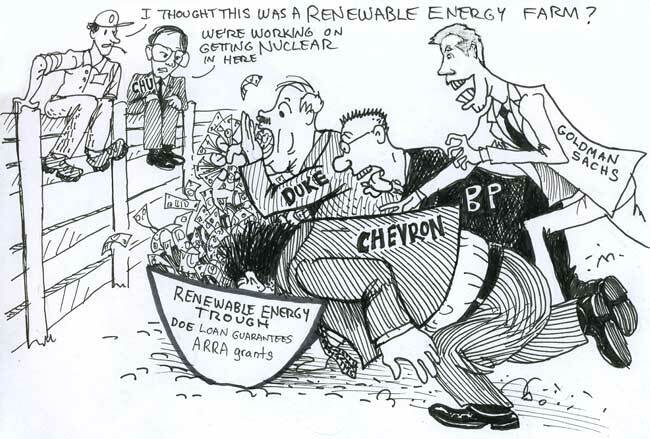 An excellent cartoon from Basin and Range Watch satirizes the companies rushing to take advantage of taxpayer-backed grants and loan guarantees offered by the Department of Energy. The funds have aided the development of renewable energy, but many companies have sought to build on pristine public land, ignoring alternative sites in cities or on already-disturbed land. Solar energy companies looking to build on public land in the Mojave and Sonoran Deserts are exploiting political and economic trends that favor renewable energy development, but what many of them are offering is not "green" energy. But this is a difficult message for national environmental organizations to convey. A picture of a massive solar energy facility is bound to provoke a positive response from most Americans. Many of us equate energy with utility-scale facilities and transmission lines, and solar energy and the desert seem to be a logical fit. Environmentalists saying no to big solar in the desert may seem like a trick-or-treater saying no to candy on Halloween. It's baffling to most people. But it is not "green vs. green." There is another form of renewable energy that much of the country has forgotten about that offers a helpful prism to use while examining the current solar rush. Hydropower dams used to be all the craze -- not because America cared about global warming (many were built in the middle of the last century when DDT seemed as wholesome as apple pie), but because we thought it was wasteful to let all of those rivers run out to sea without putting them to use. Many of our rivers ended up with at least one, if not several large hydropower dams to feed our country's appetite for energy. Hydropower, just like solar and wind, takes a renewable natural resource and turns it into energy without emitting much carbon pollution. So why aren't we building more hydropower dams to stop global warming? The answer: because hydropower dams are not "green" energy. When you block a river's flow to tap the energy potential, you infringe upon fish migration and spawning, change downstream erosion patterns, and water temperature. And some dams create unnatural reservoirs that wipe out public land. Lake Mead, the reservoir created by the Hoover Dam, drowned nearly 247 square miles of desert. All of this alters and fragments ecosystems, just like many of the proposed utility-scale solar facilities. 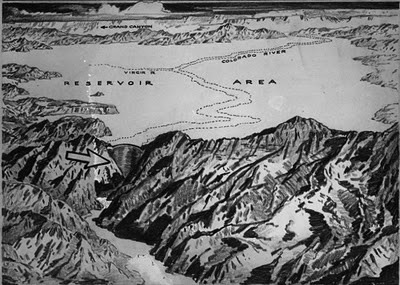 A sketch published in the Los Angeles Times in 1921 shows the Hoover Dam site, and a depiction of the reservoir it would create. The fact that the Hoover Dam produced renewable energy did not matter when it opened in 1936, and you will never hear many support more dams today as a response to global warming. The disruption of our rivers during the last century sent several species into decline, and many are on the endangered species list as a result. Today, fisherman, environmentalists, local, state, and the Federal government take any opportunity to remove hydropower dams. Nobody questions the removal of this carbon-free renewable energy source, because the environmental consequences of their construction and operation are considered too high. Unlike our majestic rivers, pristine desert is being treated differently in the energy debate. In the desert, wildlife and ecosystems are getting in the way of an agenda train that carries the urgent call to reduce greenhouse gasses, but zooms past much more sensible options for doing so, such as distributed generation, or building facilities on already-disturbed land. Energy companies and government officials portray America's southwestern deserts as the only place to build our country's renewable energy future. As the former Governor of California Arnold Schwarzenegger said, "if we cannot put solar power plants in the Mojave desert, I don't know where the hell we can put it." 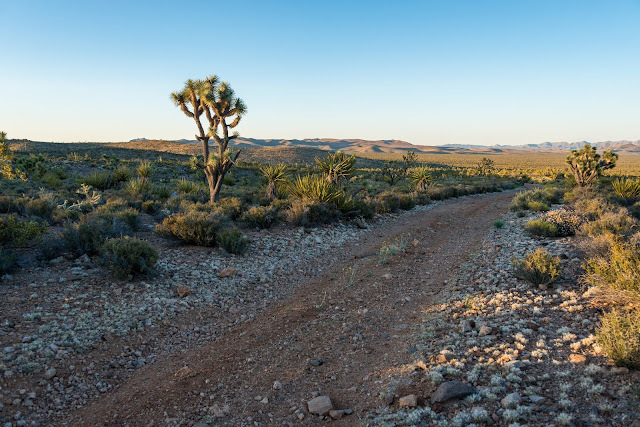 California, in all of its wisdom, assessed that a project on pristine desert habitat was absolutely necessary--no matter the costs--to stem climate change. The State did the same for several other projects that threaten to fragment rare plant and wildlife populations. 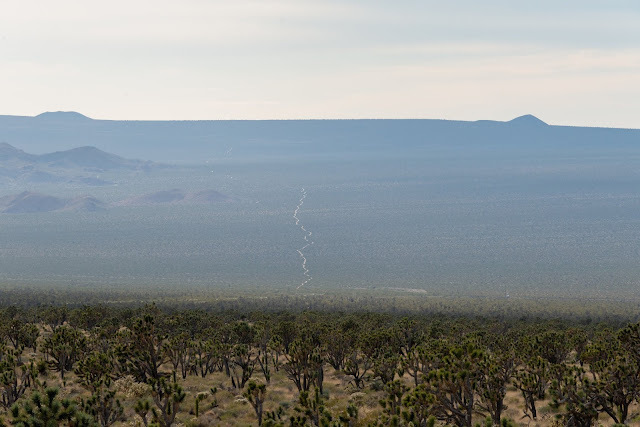 Never mind that there are better locations to put solar panels, and that putting a solar facility in the middle of the Mojave Desert would incur massive economic costs for the citizens of California. The White-margined beardtongue, a rare desert plant that could be driven closer to extinction if the Calico Solar power project is built. 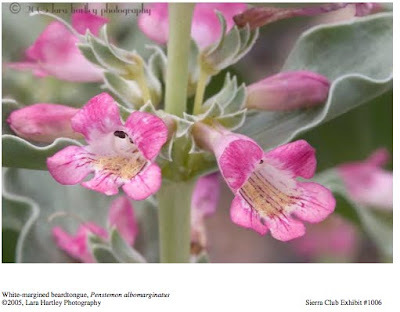 The site is home to one of the few remaining pockets of this plant in the Mojave Desert. Solar energy developers proposing projects on pristine desert benefit from solar energy's positive public image, one that has not been tarnished like other energy sources--such as hydropower and nuclear--and the industry and its investors have shrewdly sought to project an image of moral supremacy, believing that their product that should be excluded from most environmental standards. As one frustrated commenter on this blog remarked, the world's wildlife would perish under global warming because of parochial concerns for one habitat (the desert). Describing a site he had chosen for a solar facility, one solar executive said that "God made this to be a solar farm." Individuals and organizations that sponsor legal challenges to poorly sited solar power plants are criticized as unwilling to give up a slice of land to stop global warming, echoing the false logic of California's override findings. What is left unsaid by utility-scale solar advocates is that meeting all of our energy needs through utility-scale development is unrealistic. Just to meet all of California's energy needs alone would require over 600 square miles of land. That's just one state. 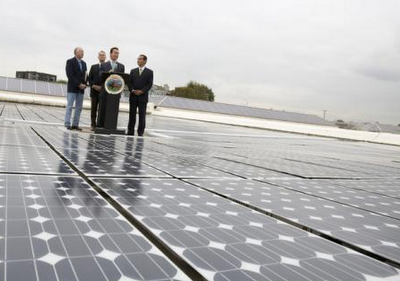 Is America willing to give up thousands of square miles to solar energy facilities? 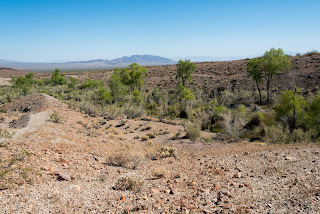 Are we ready to sacrifice the ecological health of America's southwestern deserts? It is implied in the arguments of utility-scale solar advocates that their companies are entitled to so much of our public land. If we grant solar companies access to the best of our desert ecosystems, we are saying that there is no environmental hurdle too high to stop their profiteering. 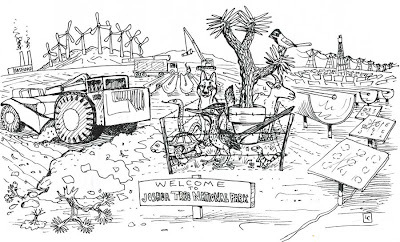 Another cartoon from Basin and Range Watch depicts the future of America's deserts if energy companies have their way -- the fragmentation of desert wilderness by a wave of utility-scale energy projects. Perhaps recognizing that the green veneer they have attempted to paint over their destructive facilities is too thin, solar companies have argued that utility-scale facilities in the middle of the desert can also change America's economic fortunes. When a judge ordered a halt to Tessera Solar's Imperial Valley solar project, the company balked that the site could have provided much needed jobs to the area. But the company is not offering "green" jobs, and the cost of the added payrolls probably will fall back on the taxpayer. Most of the projects proposed for pristine desert--including the Imperial Valley project--require taxpayer-backed financing and grants in order to get off the ground. The technology they would use would produce electricity at a cost per unit that is higher than most other forms of generation. And then they will need to build new transmission lines that add to the environmental destruction, and add to your electricity bill. The Sunrise Powerlink transmission line that would connect Tessera's Imperial Valley project to San Diego will cost at least $2 billion dollars. Power companies would pass this cost along to customers. Charging the taxpayer to create jobs seems more like a temporary welfare solution than an economic rebound. But don't we need to build up our solar and wind energy industries? Yes. But we can do that without destroying fragile ecosystems. An article published in Reuters ironically applauds China for an aggressive solar construction plan that sees "good done by solar plants" as outweighing "any damage they may do to the environment, and concerns about plants and animals are minimal." The comparison to China suggests this is not about climate change but economic competition. China continues to construct coal power plants, flooded an ecosystem with the Three Gorges River Dam, and sends us toys coated in lead. We do not need to congratulate China for prioritizing destructive industrialization over natural resources. That comparison alone should give us pause before handing over America's deserts to solar companies. The Independent Science Advisors for California's Desert Renewable Energy Conservation Plan (DRECP) suggested a policy of "no regrets" when it comes to building solar power plants. In other words, do not rush into a policy that ends up fragmenting ecosystems and driving species closer to extinction. We can reduce our greenhouse gas emissions without destroying our natural resources, and we can work with the urgency necessary without falling into the trap set by solar energy developers eager to bulldoze pristine desert. But we have been sidetracked by the corporate interests proposing utility-scale solar facilities in our deserts. The truly green solution to climate change--generating clean energy from our cities--is being neglected. Governor Jerry Brown has proposed implementing feed-in-tariffs, which rewards consumers with rooftop solar when they feed energy back into the grid. Encouraging feed-in-tariffs in all of our states could yield a boom in rooftop solar, creating jobs while preserving open space for future generations. The California Solar Initiative has installed over 700MW of solar in our cities--healthy progress for a new program--but it could benefit from more funding and public awareness. Los Angeles recently sought to cut its rooftop solar incentives because the program was running short of money. This received little attention while the national press was fixated on the Department of the Interior's approvals for several facilities in the desert last year, many of which requested billions of dollars in Federal funds and financing. Congress has not yet passed legislation to clear the way for a PACE program. PACE, property assessed clean energy, would allow homeowners to receive low-interest financing to build rooftop solar. The financing would be paid back over time through an assessment on their property tax, and the solar installation adds value to the home and cuts the owner's electricity bill. Utility-scale solar in the middle of our public lands is a dangerous distraction. Solar companies present themselves as false prophets who promise an unrealistic and destructive solution. If the solar energy industry is serious about presenting a "green" solution, then it is up to them to make smarter siting decisions. Until then, it is our responsibility to distinguish between green and greed, and start making progress on real solutions. Where can you put solar panels? Look around you -- rooftops, parking lots, and already-disturbed land. Above, Governor Schwarzenegger announces plans to clear pristine desert to make way for utility-scale solar facilities in the desert, as he stands amidst a rooftop solar array in Los Angeles. It's cheaper and its green to build solar in our cities. This is absolutely the best commentary or article yet that I have seen on this topic. Trust me I have read a whole lot of articles, most for installing these "plants" out in the desert, a lot with a certain "ring of entitlement" to them. This article demolishes the other side's arguments. First rate as usual, Shawn! Thanks so much Bill. I was fed up with some of the coverage of the legal challenges, which did not seem to do the topic justice. Indeed a very nice piece or writing. I would say that we all want to find a solution to Global Climate Change. However an ranting, opinion based blog post such as this one without a well thought out scientific fact based ALTERNATE solution to the probem is IMHO an endorsement for coal, NG, and big oil. Please make your next post about an alternate solution, then maybe more people in the mainstream will listen. Thanks for the fact filled and thought provoking article. It is unfortunate that the practice of implementing these technologies has polarized groups with common goals, somewhat dividing the advocates of renewable energy, and sub-factionalizing "environmental" interests. I think it is easy to see the real motivation involved in tired-eyes closed arguments such as Anonymous has posted. As one who has closely followed the planning and development of utility scale renewables for several years, I agree that greed is a factor. It has driven the scaling and siting of renewable energy generation and wired infrastructure in an unnecessary and destructive manner. The energy interests involved have little or no incentive to do otherwise, and continue to plan and promote RE projects that are focused on the profitable central station model of last century. That model needlessly focuses on remote development, while ignoring the economical optimization of the existing grid assets and the host of local benefits provided by renewable energy development in and near the load centers. To counter this, consumer, community, and local environmental interests should consider forming alliances and sharing resources to become fully engaged in the various infrastructure planning processes, advisory and most importantly, the prescriptive. The prescriptive processes being state and regional infrastructure planning performed by the Balancing Authorities (CAISO, WAPA, etc.) The Balancing Authorities, (BA) processes are the forum where "zones" suitable for renewable resource development are being considered in the identification of "needed" transmission infrastructure. After BA approval, these projects subsequently move on to the various rate-making approval and environmental review processes. Under federal state rules and tariffs, the BA planning processes are required by law Open and Transparent. Furthermore, these processes are also obligated to perform cost benefit analyses including viable alternatives such as distributed generation. Without the counter balancing involvement of interests outside of the energy industry, these processes will continue to ignore these obligations, the net result being unneeded, costly, and destructive energy sprawl in remote places. Moreover, reactionary intervention in the approval process is for many reasons proving problematic. Early and concerted participation in planning could help turn this around and make the benefits of renewable energy more tangible for local communities and help the mere rate-payer. Keep up the good work in sharing your knowledge--A very informative blog. Anonymous, I'm not sure if you missed the latter portion of the post, but I devote that to the alternate solution of distributed generation. That would involve actually utilizing the scalability of solar and wind. I also support siting solar on already-disturbed land. The point of the blog post is that we should not sacrifice our pristine desert land for utility-scale solar. There are plenty of other options beyond that. You addressed the current big energy in the desert issue very thoroughly. @Anonymous : The true envoronmental solution is to blanket our buildings with solar panels and not look to our deserts for a cheap solution.